For a long time, I haven’t been able to find a good PDF editor for Linux, until I stumbled upon Able2Extract Professional a while ago. I know you can edit PDF file in LibreOffice and Master PDF editor, but Able2Extract blows them out of the water in terms of features. With a price tag of 149.95 USD (life-time license), it costs only a fraction of the price of Adobe Acrobat. 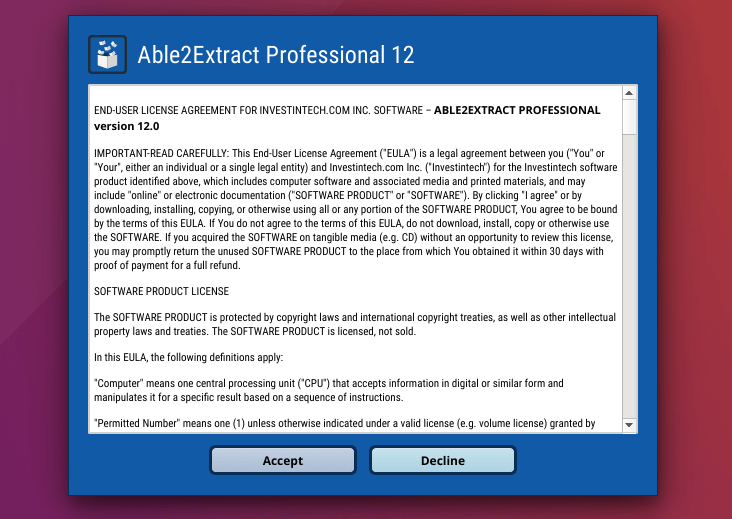 In this post, I will show you how to install Able2Extract on Linux and demonstrate its various features. 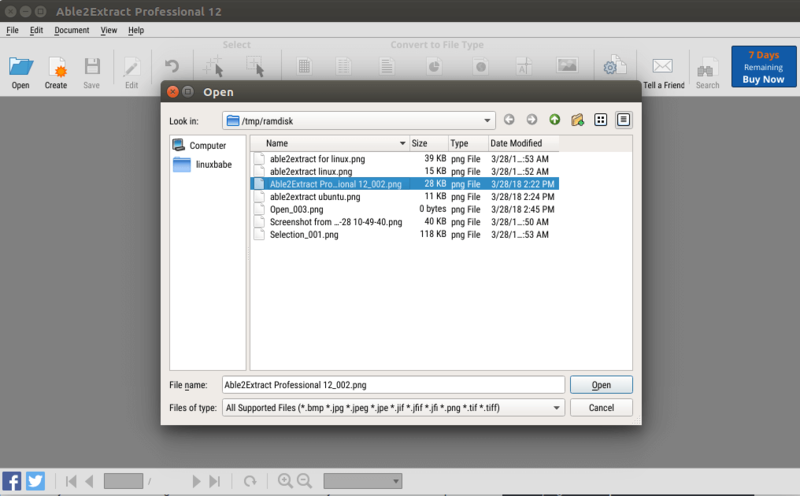 Note that Able2Extract depends on the CUPS service to print documents, which by default is enabled on Ubuntu. But I disabled it in the past, so I need to start and enable this service again. After running the install command, Able2Extraxt Professional will be installed under /opt/investintech/a2ep/ directory. Before we can start it from application menu, it is advisable to run it from the command line. You might get the following error message, which prevents Able2Extract from running. QFontDatabase: Cannot find font directory /usr/ITech/Qt/5.3.1-31/x64_d_d_r/lib/fonts - is Qt installed correctly? The solution to this is creating the directory and then link it to the system fonts directory (/usr/share/fonts). Now you can start Able2Extract from application menu. Upon first start, you need to accept the end-user license agreement. Then you will be greeted with a simple and straightforward user interface. Again, you need to run it from the command line first and fix the error by using the solution mentioned above. 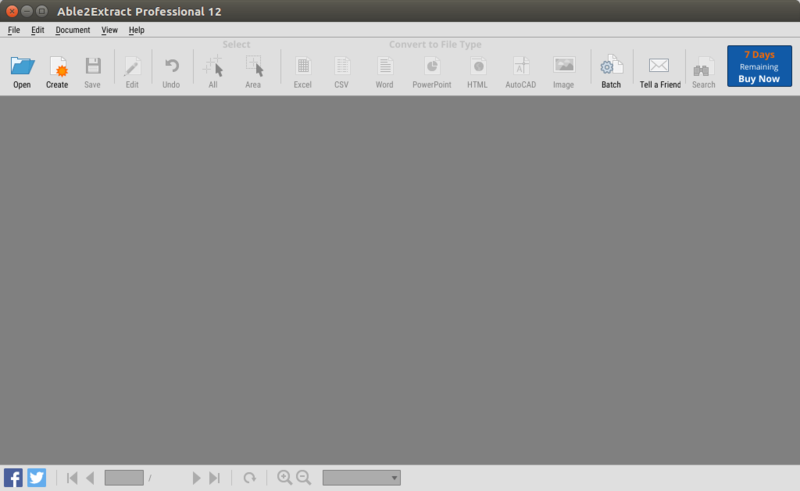 The process of creating a new PDF file is a bit strange in Able2Extract Linux version. You can click the “Create” button or “File -> Create PDF” menu command, but then you will be instructed to open an existing jpeg/png to edit. There’s no way to name a blank PDF file. After opening the image file, you should click the Edit button on the toolbar. 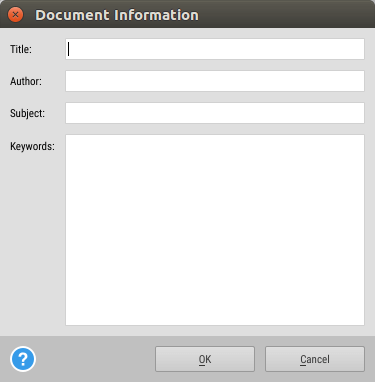 Then click Insert button on the right panel to insert a blank PDF page. Next, you should click the Delete button on the right panel to delete the image from Able2Extract. The right sidebar allows you to add text, vector graphics, images (JPG,BMP,PNG,TIFF and GIF) to your blank PDF page. You can also easily delete objects from your page and redact your text to protect private information. There’s also options to choose font, text color, and rotate your page. Once you are satisfied with your creation, click Save button on the toolbar and give it a filename. After closing Able2Extract, you can double-click your PDF file in file manager to open it in Evince PDF viewer. You can edit your document’s title, author, subject and keywords like below, which is accessible from File -> document information menu. 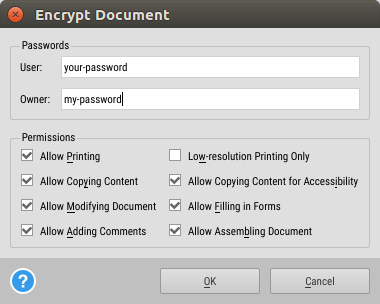 You can password-protect your PDF file by clicking Edit -> Encrypt Document. You can also choose to set up permissions for printing, copying, modifying, adding comments, allowing only low-quality printing, etc. This way you can limit the recipient’s options. This feature is also accessible from View -> PDF Creatation Options -> Security menu command. Note that sometimes this menu command isn’t clickable, in that case, you need to click the Edit button on the toolbar. Once you set a password, remember clicking the Save button. If you don’t want to password-protect it anymore, then open the PDF file in Able2Extract, then go to Edit -> Decrypt Document to remove password protection. To add annotations, you need to exit from editing mode by reopening the file. The annotation penal is on the right sidebar. You can add sticky notes, links, stamps, highlights, underlines, squiggly lines, strikethroughs, carets, attachments and watermarks. Able2Extract allows you to permanently hide sensitive information from the PDF file. It’s capable of redacting individual sections, lines and entire page content. 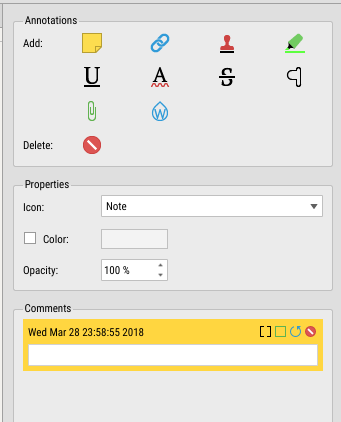 This tool is accessible on the right sidebar in editing mode. 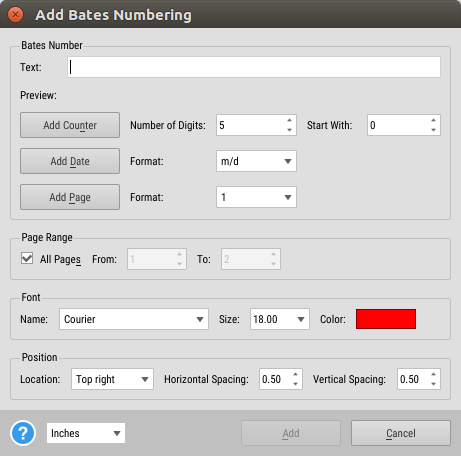 You can add pagination to PDF file by going to Edit -> Bate Numbering. It accessible only in editing mode. Able2Extract Professional users can convert their PDF files into several different file formats: MS Excel, Word, PowerPoint, Publisher, LibreOffice (Calc, Write and Impress), HTML,AutoCAD (DWG and DXF), CSV and Image formats (JPG, GIF, PNG, BMP, TIFF). Simply open your PDF file in Able2Extract, then select the pages you want to convert or select all, and select the file format to convert to. Note that if you have LibreOffice installed on your Linux machine, then the PDF will be converted to .odt file if you click the Word icon. To select which pages to convert, click Edit -> Select Page Range command. Able2Extract Professional’s major strength is the accuracy of converted documents, especially for complex conversions such as PDF to Excel and scanned (image) document conversion. These types of conversions have been difficult to perform with complete accuracy in the past. Able2Extract can also perform non-PDF conversions directly into Excel spreadsheets. Users can now easily transfer text and content from Word, PowerPoint and more into spreadsheets they can then instantly analyze. Able2Extract uses advanced OCR technology that can convert even poorly scanned documents or electronically created files that contain damaged fonts. The process of converting scanned (image) documents in Able2Extract Professional is the same as any native PDF conversion process. Once you open a PDF file, the application will, by default, automatically detect if the file is a scanned PDF or not. You can then convert them to desired output format in the same manner. Although not perfect, Able2Extract is a very good, feature-packed PDF tool available for Linux. Thanks for visiting. As always, if you found this post useful, then subscribe to our free newsletter to get more tips and tricks. 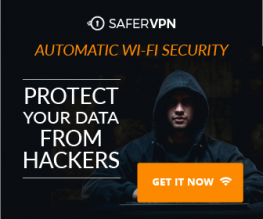 it’s nice but at 149 USD it’s expensive for a single private user.